Journal Macro is an easy-to-use keyboard and mouse macro recorder, editor and player designed to help you eliminate repetitive operations. You can use it as a keystroke recorder, an auto mouse clicker, an auto mouse mover, a program launcher and so on. It is the easiest way to make working in Windows faster, easier, and more productive. This product can record keystrokes, mouse movements and clicks into a macro and play them back under Pulse mode or Flow mode. Under Pulse mode, keystrokes and mouse clicks are played back one by one at a certain interval and mouse movements are ignored. Under Flow mode, keystrokes, mouse movements and clicks are played back at an adjustable speed. Keystroke. Type text into any application. Delay for an amount of time. 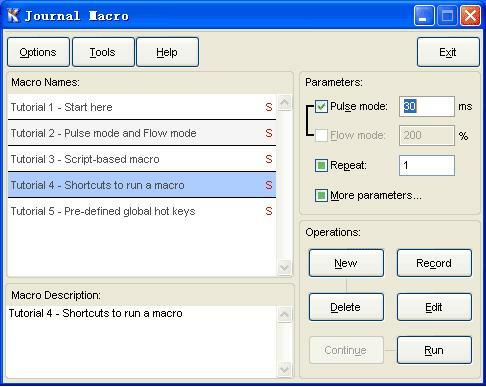 You can play back macros using global hot keys, keystroke sequence triggers and shortcut menus. A global hot key is a key combination such as “Ctrl+Alt+M”. A keystroke sequence trigger is a small bit of text such as “conT” or “&&&” that Journal Macro will watch for as you type. You can add the seldom-used macros to shortcut menus, which will pop up when you press its global hot key or move the mouse pointer to the up-left corner of the screen. Insert Pause during recording to skip what you do not want to record, such as a password. Most of the functions have their global hot keys. For example, the global hot key for recording a new macro is “Alt + Insert”. Search for the target window intelligently under Flow mode. Call macros within batch files (*.bat). Find windows with wildcard strings.